Mon., Jan. 8, 2018, 10:15 a.m.
SEATTLE – Kyle Juhl made one last attempt to patch things up with his fiance, then took back his ring, put a gun to his head and pulled the trigger as she and her mother ran from the apartment. The bullet went through a wall and narrowly missed a neighbor’s head as she bent to pick up her little boy. The Smith & Wesson 9 mm that Juhl used to kill himself in Yakima in 2014 was familiar to law enforcement: The Washington State Patrol had seized it years earlier while investigating a crime and then arranged its sale back to the public. It eventually fell into Juhl’s hands, illegally. It’s fears of tragedies like that, or worse, that have created a split among law enforcement officials over the reselling of confiscated guns by police departments, a longtime practice allowed in most states. Juhl’s gun was among nearly 6,000 firearms that were used in crimes and then sold by Washington law enforcement agencies since 2010, an Associated Press review found . More than a dozen of those weapons later turned up in new crime investigations inside the state, according to a yearlong AP analysis that used hundreds of public records to match up serial numbers. The guns were used to threaten people, seized at gang hangouts, discovered in drug houses, possessed illegally by convicted felons, hidden in a stolen car, and taken from a man who was committed because of erratic behavior. While those dozen or so guns represent an extremely small percentage of the resold firearms, some police departments contend the law shouldn’t be doing anything to put weapons back on the street. The AP did not look at how many of the resold guns figured in crimes committed out of state, so the actual number of misused weapons could be higher. Similarly, the International Association of Chiefs of Police says confiscated guns should be destroyed because putting them back in circulation “increases the availability of firearms which could be used again to kill or injure additional police officers and citizens.” Also, federal agencies must destroy seized firearms unless they are needed as evidence or being used by the agency. On the other side of the debate, some law enforcement officials say the selling of guns raises money to purchase crime-fighting equipment, and if the practice were abandoned, people would just buy weapons somewhere else. In fact, a growing number of states from Arizona to North Carolina are passing laws prohibiting agencies from destroying guns. Phyllis Holcomb, a manager with the Kentucky State Police, which oversees Kentucky’s gun sale program, said such transactions have helped equip officers with body armor and other gear. 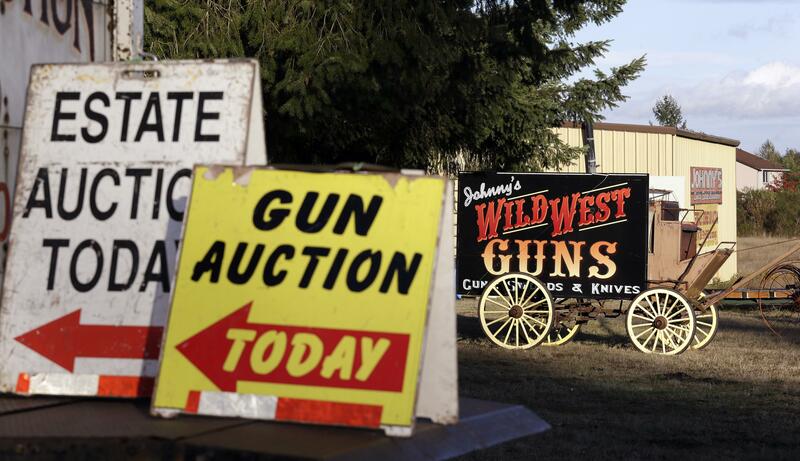 The debate is playing out in Washington state, where the State Patrol is pushing back against a state law that requires the agency to auction off or trade most guns. The State Patrol hasn’t sold any weapons since 2014 and at one point accumulated more than 400 in the hope the Legislature would change the law and let the agency destroy them. Democratic Rep. Tana Senn of Bellevue is sponsoring such a bill. “I know many of the police chiefs in my district chose not to sell but rather to destroy, and in their own words, `It’s so we can sleep at night,“’ Senn told a legislative committee. The National Rifle Association opposes the plan. “The police chiefs maybe could sleep better if they went out and apprehended the criminals behind the guns and didn’t worry about destroying perfectly legal firearms that are no more easy to purchase than a brand-new firearm at a firearms dealer,” NRA spokesman Tom Kwieciak said. Tragedies involving police-sold guns have happened throughout the U.S. In 2010, a mentally ill man ambushed and wounded two Pentagon police officers with a handgun sold by Memphis, Tennessee, police. Also that year, a Las Vegas court security officer was killed by a man with a shotgun sold by a Memphis-area sheriff’s office. And in 2015, an unstable man walked into City Hall in New Hope, Minnesota, and wounded two officers with a shotgun sold by the Duluth Police Department. The department has since stopped selling guns and now destroys them. The weapons sold back to the public in Washington include Colt, Glock and Ruger pistols, 12-gauge shotguns, .22-caliber rifles and assault weapons such as AR-15 and SKS rifles. All such sales are handled through federally licensed firearms dealers, including auction houses, pawnshops and sporting goods stores. Before buyers can take their guns home, they must pass an FBI background check. On a recent Friday night, owner John West of Johnny’s Auction House in Rochester, Washington, about 80 miles south of Seattle, launched into his rapid-fire bid-calling to a packed room, selling necklaces and coins. Before he offered up the first police-confiscated gun for sale, he had a warning. There is no master list of guns sold by police, so compiling one for Washington state involved dozens of public-records requests to individual agencies. The federal Bureau of Alcohol, Tobacco, Firearms and Explosives keeps track of crime guns but refused to release information from its database, so the AP collected databases from individual agencies and compared them with the sold guns. One of the guns that ended up in a new police report was a .22-caliber handgun sold by Longview police in 2016. In 2017, a drunken Jesse Brown and a friend armed themselves with the gun and two other weapons, went to a house and threatened two young men they believed were selling drugs, police said. Longview Police Chief Jim Duscha said that while some resold guns may be used in new crimes, “if they’re going to get a weapon, they’re going to get a weapon.” Selling guns generates money used for drug investigations, he said. The Seattle Police Department and the sheriff’s office in surrounding King County don’t sell crime-scene weapons; they hand them over to a foundry to be melted down at no cost to themselves. For years, the State Patrol traded confiscated firearms to dealers for other gear, and the dealers then would sell the guns to the public. In one exchange in 2013, the State Patrol traded in 159 weapons and got a credit of $27,420, which it then used to buy handguns for the force. The weapon Juhl used to kill himself was in a batch the State Patrol traded in 2012. It was purchased by a man in Yakima, who sold it to someone else, who then sold it on Craigslist. Juhl’s girlfriend told police that’s where he acquired it. Juhl, 24, was not legally permitted to own or possess a gun. He received a bad-conduct discharge from the Army after serving time in prison for using the drug ecstasy and going AWOL for about two months. An Army spokesman said Juhl’s criminal history was sent to the FBI’s Criminal Justice Information System, but the police detective who handled Juhl’s suicide said he checked the FBI’s database but didn’t find Juhl’s convictions. Published: Jan. 8, 2018, 10:15 a.m.